Cocka-doodle-doo! We all know the familiar sound that a rooster makes, especially at the most inconvenient times in the morning. 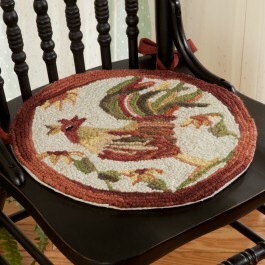 Here at Sturbridge Yankee Workshop we adore farmhouse friends, especially the rooster, an enjoy the country feel that rooster themed decor can bring into a home. Whether you live in a rustic, primitive farmhouse or enjoy the high ceilings and tall windows of a big city flat, roosters are a versatile style that will work well with any decor. Instantly increase the country decor theme in any room with a coordinating set of chair pads and a matching rug. 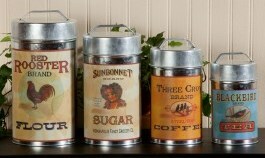 Use these pieces in your dining room or kitchen for an instant enhancement! Artist Carol Endres created this imagery featuring a crowing rooster standing proud amongst tall sunflowers in the yard. Muted tones of sage and brick red make these pieces feel quite country indeed. 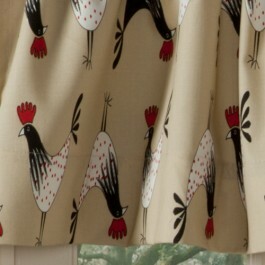 For an unexpected curtain and chair pad collection, consider website exclusive Retro Rooster Curtains. 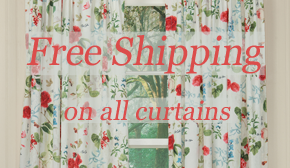 We just love this collection for its ability to compliment country farm decor, as well as those wishing to create a retro ‘1950’s’ feel. 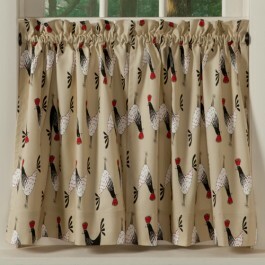 Repeated pattern of roosters in red, black and white is displayed on durable, khaki colored 100% cotton fabric. 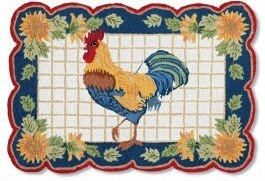 Collection features tiers, valance and Retro Rooster Chair Pad. 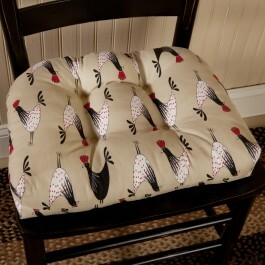 Chair pads are tufted for a very comfy seat and include strong chair ties to secure cushion in place. Roosters are known for their bright plumage, especially when they are strutting their stuff around the farm yard. 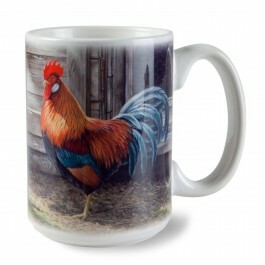 On Rooster Mug, a vividly colored rooster decorates the side of a rather large 14 ounce mug just right for sipping your favorite beverage in the morning, or for warming up with a spot of tea in the afternoon. 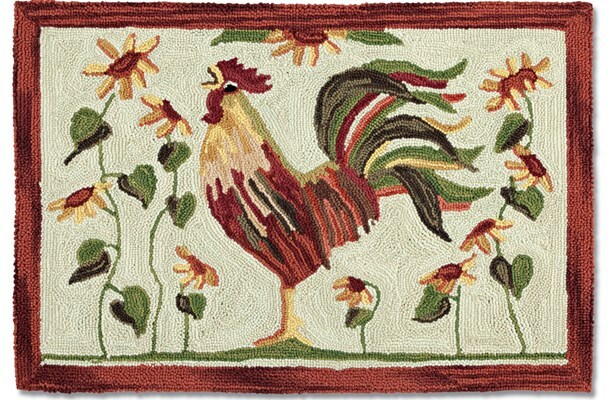 Paired with a French country inspired rug like Scalloped Rooster Hooked Rug, or the vintage appeal of Farmhouse Storage Tins, your home will be full of rooster fun in no time! 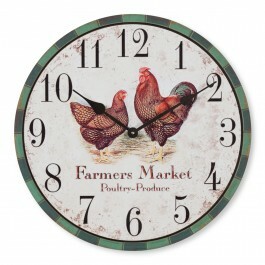 Farmers Market Clock adds instant access and a reminder of the time in your kitchen or dining room. Made right here in the USA for additional country home charm, this clock features felt tipped pegs to keep it hanging flush, and colorful artwork with a textured finish that will protect it from damage. 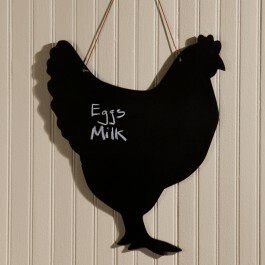 With Rooster Chalkboard hanging in your kitchen, you will always remember to buy the eggs. 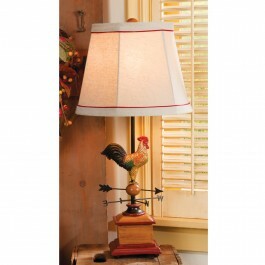 Rooster Vane Lamp lights the way and offers a whimsical accent to your reading nook. This entry was posted on Wednesday, January 29th, 2014 at 10:00 am	and is filed under Bedroom, Rugs, Thematic, Wall Decor. You can follow any responses to this entry through the RSS 2.0 feed. You can leave a response, or trackback from your own site.